Welcome To Conway Living! .... Conway, South Carolina! Unfortunately, most people only know Conway, South Carolina as.. "that town you drive thru when you go to Myrtle Beach" We are soooo much more than that! On your next trip to the beach, or on your way out, take an hour or two and come visit us! Drive around for a while and explore our wonderful historic rivertown city! Those that have visited with us before (and especially those of us that live here) know we have some of the best restaurants, stores, little shops, bed and breakfasts, and old-town river scenery on the Grand Strand! Not to mention we have some of the nicest people you will ever meet! 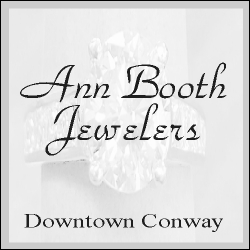 Only the best in southern hospitality in Conway! Conway is only 14 miles from the heart of Myrtle Beach so why not take a full-day or half-day trip up to see us on your vacation! Take a tour of the Waccamaw River, take in a show at the downtown theatre, walk around to shop and eat, or leisurely stroll the riverwalk to take in the scenery! In fact, for your next vacation, come stay in Conway! Enjoy all we have to offer - then take a short drive and have a day at the beach!